The new 10 megapixel Olympus E-520 DSLR camera is an evolutionary upgrade to last year's popular E-510 model. It boasts some notable advancements including wireless TTL flash control, Shadow Adjustment Technology, improved image processing, two extra scene modes, Face Detection and more convenient auto-focus options�in Live View. The E520 also offers a bigger LCD, a larger raw buffer and a nominally increased continuous shooting speed of 3.5 frames per second than found on the older E-510. At the same time it retains some key headline features of its predecessor, such as a high-resolution LiveMOS sensor, highly effective SSWF dust buster, body-integrated image stabilisation, configurable mirror lock-up, user controllable noise filtering, in-camera raw development, pixel mapping, corner shading compensation, excellent ergonomics and a wealth of metering modes, including no less than 3 different types of spot metering. All of this functionality is housed in a compact body weighing less than 500 grams, and currently retails for less than �500 / $750. Zoltan Arva-Toth put the Olympus E-520 through its paces, in conjunction with the new Zuiko Digital ED 14-35mm f2 SWD and ED 50-200mm f2.8-3.5 SWD lenses. The Olympus E-520 is very similar in its design to its predecessor the E-510, and for the most part, this is a very good thing. For the engineers at Olympus somehow managed to make these rather small DSLRs comfortable for photographers with "normal" male hands, something that most of the direct competitors have largely failed at. In particular, the right-hand grip is big enough to accommodate all of your fingers without looking disproportionately large for the rest of the body. Most external controls �� which are unchanged from the E-510 except for cosmetic changes to their styling and labelling � are easy to operate, the exception being the power switch, which is a bit too close to the control wheel. I counted a total of 19 buttons including the shutter release, plus there's a traditional mode dial, a dioptre adjustment wheel and the afore-mentioned on/off switch and control wheel. This is about as many as could sensibly be crammed onto the relatively small body. Many controls have multiple functions depending on whether you are in playback or record mode, whether Live View is on or off, and some other factors. A few of these have their secondary function clearly marked, but others do not, and this might make your life a bit difficult in the first few days of using the camera. Weighing in at approximately 475 grams without a battery, the E-520 is among the lightest DSLRs ever manufactured, with only Olympus' own E-4xx models and Canon's recently announced EOS 1000D / Rebel XS being lighter still. This also means, of course, that it may feel a little unbalanced with a heavier lens attached, but the remedy is easy: hold the weight of the combo by the lens in the left hand, and use your right hand to operate the controls. This is what I did with the Zuiko Digital ED 14-35mm f/2 SWD and ED 50-200mm f/2.8-3.5 SWD lenses mounted, and it worked very well. Naturally, when you use the E-520 with lighter optics such as the kit zooms, you can also hold the camera's weight in the right hand, clutching that effective grip. Pure one-handed operation can be achieved when using small primes such as the 35mm Macro or the 25mm "Pancake" lens. The Olympus E-520 sports a traditional eye-level optical TTL finder, which is bright, contrasty and eminently free of any distortions or aberrations, but rather small. It's fine for framing but not so great for manual focusing, which is better done in Live View. If there's one thing Olympus should have improved over the E-510 but didn't, it's increasing the viewfinder magnification, even if that meant some sacrifices with regards to the brightness. The in-finder status LCD runs vertically along the right-hand side, just like in the E-510, but unlike in the E-1 or the E-3, where it is in a more traditional place at the bottom. The 2.7" rear LCD screen is a little bit bigger than the one on the E-510, albeit its resolution is unchanged at 230,000 dots. It has a very wide viewing angle and can be seen outdoors in the sunshine too, but only if you crank up its brightness to the maximum. Its colour temperature can also be modified if you think it doesn't match that of your calibrated computer monitor. The contrast and gamma of the screen cannot be altered. As the E-520 doesn't have a separate monochrome LCD, the rear screen doubles as a status display, which can be called up by pressing the INFO button in record mode. Moreover if you press OK instead of INFO, you can also change all important settings right on the screen, which Olympus calls the Super Control Panel. This ingenious solution spares you the pain of having to enter the long-winded, complicated and not entirely logical menu, and makes most settings changes extremely simple. An even faster way to access a function is by pressing its dedicated button if it has one, and turning the control wheel to make changes. Functions having their own button include ISO, AF mode, AF area, WB, metering mode, IS, Live View, autoexposure lock, drive mode, flash mode and exposure compensation. In addition to these, there is a customisable Fn button, which you can designate to perform things like DOF preview or one-touch WB, or to act as a quick AF/MF or RAW/JPEG toggle. One of the most important functions of the LCD is providing on-demand Live View in record mode. Olympus is credited with pioneering continuous full-colour DSLR Live View in their Evolt E-330 model of 2006. That camera offered this feature in two flavours. Mode A used a small secondary sensor for Live View, and enabled fast auto-focus with no shutter lag penalty, whereas Mode B used the main sensor and was better suited to manual focusing and tripod work. Since then, virtually all the DSLR manufacturers have started to offer a similar feature in their DSLRs, but only Sony thought it was a good idea to use a secondary imager, while all the others, Olympus included, have taken the route of providing Live View off the main sensor. 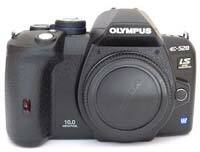 Olympus dropped Mode A completely, and offered only Mode B in the E-410 and E-510. This is the case with the E-520 too, but significant improvements have been made to the way auto-focusing works in this mode. In the E-510, it wasn't possible to use the usual half-press on the shutter release to acquire and lock focus � you either used the AFL button and witnessed a "mirror slap-dance" during which you could only see a darkened and frozen image on the LCD, or pressed the shutter release button all the way down and hoped the resulting image would be in focus. With the E-520, Live View AF has become much more convenient. With certain lenses attached � currently the Zuiko Digital ED 14-42mm f/3.5-5.6, ED 40-150 f/4-5.6 or 25mm f/2.8 � the E-520 can auto-focus using the imager only, much like a compact camera. In this 'Imager AF' mode, focus is acquired and locked via a half-press of the shutter release, without the mirror having to flip down and up again just for the sake of focusing. You can pick any of 11 AF points and can even activate Face Detection, something that no other DSLR has offered until now, excepting the E-520's sibling the E-420. While I don't think a DSLR user really needs this, it can be useful when you ask someone who is totally unfamiliar with the camera to take your picture. There's also a 'Hybrid AF' mode, in which approximate focus is achieved via this contrast-detection method, but the 'real' AF sensors still get engaged when you fully depress the shutter for taking the shot. When any FourThirds lens other than the three mentioned above is mounted, the camera defaults to this mode in Live View even if 'Imager AF' is selected. Note that in this case, you can only choose from 3 AF points as opposed to 11. Finally the old, slowest method, inherited from the older model, is also available under the name 'AF Sensor'. While all this is certainly an improvement over earlier models, Live View AF is still nowhere as fast as it was in Mode A on the E-330. Which means that main-sensor Live View is still a framing and manual focusing aid, more than anything else. And at these functions, it certainly excels. While the E-520 lacks the articulated screen of the E-3, it can still be used to conveniently frame your photos when shooting from the hip or from above your head, owing to the wide viewing angle of the new LCD, and manual focusing is greatly enhanced by the 'enlarged display' function. Once you have selected manual focus mode and entered Live View via its dedicated button, press INFO repeatedly until a green rectangle appears in the middle of the display. You can move this rectangle around using the four-way pad (direct access to ISO, WB, metering and the Super Control Panel are disabled while you're on this screen), and magnify into it by pressing OK. The default magnification is 7x, but you can raise this to 10x by turning the control wheel. This is real, non-interpolated magnification, very useful for accurate manual focusing. Holding down the IS button will steady the live image (note that the stabilisation starts with a one-second delay), which is a great help. Pressing OK again will let you see the full frame again. This is not the only screen available in Live View. You can specify how much shooting information you want to be overlaid, can call up a live histogram or a shooting grid (though sadly, not both at the same time), and can view what effect the different WB settings or different amounts of exposure compensation would have on the final image, in a multi-frame window. The Super Control Panel can be called up�by pressing OK while any of these screens is displayed, except when the green rectangle is shown or when you are in enlarged view, as indicated above. When available, the Super Control Panel appears as a semi-transparent overlay, but can otherwise be used as usual. For low-light or infrared shooting, you can enable a feature called Live View Boost from the menu, but in this case, the live histogram may not function properly. Speaking of the built-in flash, it can now also act as a controller for the new FL-36R and FL-50R units that support Olympus' wireless TTL flash system. Other flash modes include Auto, Manual, Fill, Slow Synchronisation on the 1st and the 2nd curtain, or almost any of these combined with red-eye reduction. Not all flash modes may be available in every shooting mode. The guide number is 12 (in metres) at ISO 100. 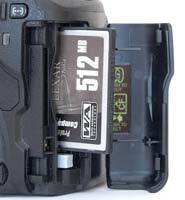 Flash exposure compensation and flash bracketing are available. Note that if you use one of the larger wide-angle lenses, the lens barrel may cast a crescent-shaped shadow on the lower part of the photo, so use an external unit in these cases. This does not happen when the small 14-42mm kit zoom or a telephoto lens is mounted. The list of the E-520's features and capabilities doesn't end here. We've already mentioned the image stabilisation (IS) function when talking about steadying the enlarged view available in Live View, but that is just a fringe benefit of IS. The real use comes when taking hand-held shots at shutter speeds that are critically slow for the focal length used. In the earlier IS-enabled Olympus DSLRs, IS had two modes, one for general use and one for horizontal panning, in which the stabilisation system only counteracts vertical hand-shake. The E-520 adds a third mode for vertical panning. Some Leica-branded FourThirds lenses feature Panasonic's lens-based Mega Optical Image Stabilisation system, but it does not work in synergy with the sensor-based system of the E-520. If you have one of these lenses, you will have to choose between the two IS mechanisms based on which one works better for you. Remember that the stabilisation effect can only be seen in the optical viewfinder if the lens-based system is used; the effect of the in-body stabiliser can only be previewed in Live View. Finally, it has to be mentioned that Olympus now provides IS for any lens, not just those developed for the FourThirds system. This is important because many legacy lenses, including those made for the Olympus OM, Nikon F, Pentax K, Leica R, Contax RTS, M42, Exakta and a couple of other mounts can be attached to the E-520 via appropriate adapters. You can now manually enter the focal length of these lenses, which helps the image stabiliser calculate the right amount of vibration correction. Another feature of the camera is the venerable if slightly bombastically named Supersonic Wave Filter, jocularly referred to by Olympus users as the dust buster. This automatic sensor cleaning mechanism was first seen in the E-1 and has been an integral part of every FourThirds DSLR ever since. This filter sits in front of the sensor and literally shakes off dust particles by vibrating at an extremely high frequency. It certainly works: before returning my review sample to Olympus after lots of lens changes and Live View use, I took a shot of the sky at f/22 to look for evidence of sensor dust, but saw none. A further godsend is the Pixel Mapping function. 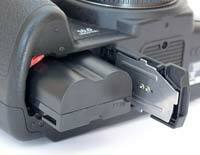 Digital camera sensors contain millions of pixels and usually there are a few that do not work. These are referred to as "stuck" or "dead" pixels, and their numbers might increase somewhat during the camera's lifespan. These can be seen as tiny bright white spots in an image. These pixels can be mapped out, but most manufacturers require you to send your camera in to a service centre for this, and perhaps also to pay a fee. Users of the Olympus E-520 can do this themselves simply by activating the Pixel Mapping function from the menu. The E-520 has a number of extra features which, while not quite as unique as the one above, are typically found in cameras that cost hundreds of pounds more. These include user configurable mirror lock-up � which is called Anti-Shock by Olympus, for some reason � and spot metering, which comes in no less than three variations: midtone-based, shadow-based and highlight-based. The latter two make life easier for those who know what spot metering is but do not know how to use it in combination with exposure compensation. These options come on top of the usual centre-weighted and evaluative modes, and all of these work with legacy lenses, though you manually have to stop them down to the working aperture. The AEL button can be separately configured, so even if you have, for example, centre-weighted set as your working mode, the AEL button can be designated to use highlight-based spot metering. This is how I made sure the sky in the photo of the crane in the Sample Images section was bright but not blown. When it comes to storing your photographs the Olympus E-520 allows you to use Compact Flash or xD-Picture cards, but although it's possible to have one of both inserted at the same time, you cannot simultaneously record an image on both, as only one of them can be selected at any given time as the active medium. You can, however, copy already recorded images from one card to the other, which is great if you want to make backups in the field. The E-520 runs on the same proprietary BLM-1 lithium-ion battery that powers Olympus' other DSLRs, excepting the E-4xx series. The included charger, however, is the slow-ish BCM-2 and not the faster BCM-1, which was shipped with older models such as the E-1. PhotographyBLOG is a member of the DIWA organisation. Our test results for the Olympus E-520 have been submitted to DIWA for comparison with test results for different samples of the same camera model supplied by other DIWA member sites.